SoundMeter 8.3 and SoundMeter Pro 4.3 can now log sound levels at user-defined intervals for an arbitrarily long period of time. Each includes a new option to automatically export logged measurement data when the measurement duration is reached. If Auto Stop is disabled, SoundMeter will continue to save the current logged data to a new data file each time the duration is reached. This new Auto Save option has been added to both the Meter and Octave tools. Data logs can be automatically saved to CSV, TXT, or MAT files. 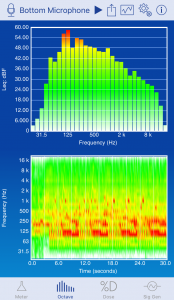 When logging, Leq, Lp_max, and peak sound levels can be reset each time they are logged. With this option, it is possible to log a short Leq of 0.1 seconds for up to 8 hours. With the new Auto Save feature, the logging can be extended indefinitely. When logging Lx values in the Meter tool, the user-defined percentile value will be fixed at the time logging starts. It is still possible to view different user-defined percentile values in the live meter display while the fixed percentile values are being logged. A bug has been fixed which could cause errors in the Octave data when logging was enabled. The formatting of the HTTP file server pages has been improved. Audio input management has been improved to avoid the potential for transient noise from the hardware when a new measurement is started. SoundMeter Pro uses much less memory when exporting data logs to CSV and TXT files. The Octave log surface plot uses much less memory when viewing large data sets. Other cosmetic enhancements and stability improvements. In SoundMeter, the new features will require the purchase of one or more upgrades, which are available via in-app purchase. They are included in SoundMeter Pro. SoundMeter 8.3 and SoundMeter Pro 4.3 are now available for download on the App Store.